Modern Doors take a look at the most common veneer patterns they achieve in their bespoke doors. The majority of people when considering good quality internal doors for their home immediately assume that the door should be made from solid hardwood rather than a veneer which is often considered as a cheap alternative. However, even ignoring the heavy environmental impact of the rapid depletion of common hardwood species that would occur if we were all to manufacture our doors from solid timber, there are many advantages of using a veneer. 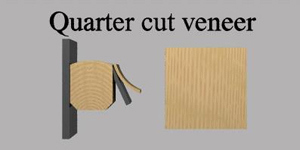 A veneer is a piece of wood which is sliced thinly and applied to an engineered material such as chipboard or MDF to gain the appearance of a solid piece of timber. Its thickness often depends on the type of timber, however can vary from 0.3mm to 9.5mm with the most common being approximately 0.8mm thick. Many of the most popular and decorative timbers for structural reasons are not suitable for use in solid form. Even well seasoned timbers are subject to shrinkage, splitting and twisting. This, along with their irregular microstructure which can shorten the grain and reduce its longevity and strength, can bring certain disadvantages in its use. On the other hand using a veneer can have many advantages, especially in the manufacture of bespoke doors. As well as reducing the cost of materials, using veneers can greatly enhance the design capability as small sections of rare hardwoods or burrs can be cut and knitted together to cover larger areas. Furthermore, veneers can be cut and placed in distinctive patterns that otherwise would not be achievable using solid timber. The half log is mounted with the heart side against the guide plate of the slicer and then sliced parallel to a line through the centre of the log. As the crown cut moves through the log towards the centre the leaves become wider with the crown narrower and strongly defined with wider straight grain sections to each side. The quarter log is mounted on the guide plate in such a way that the growth rings from the log are sliced by the knife at right angles producing a series of strips. 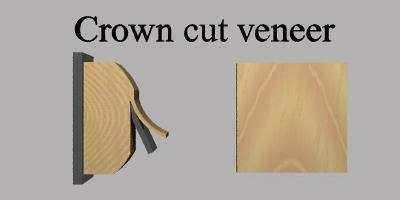 Veneer cut from this section produce parallel growth rings hence a straighter grain pattern depending on the timber in question. Different timber species produce different grain patterns, structures and colourings and the method of working with veneers requires skill and experience. By choosing the veneer and the way in which it is laid you can create bespoke doors that are unique in design and can help create a striking and sophisticated home interior. At Modern Doors, we have decades on experience in producing exactly the desired finish on our external and internal doors. 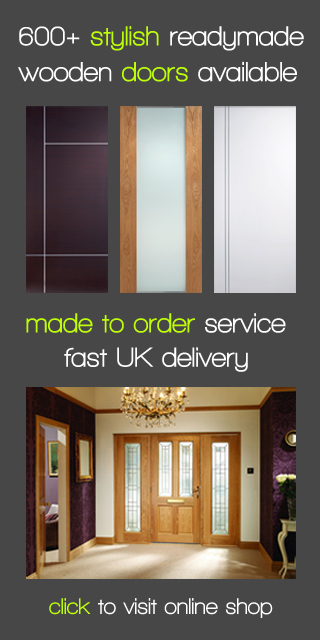 Please get in contact today to discuss how we can turn your plans into reality with one of our sensational bespoke doors.